Hi friends! I hope you’ve all been having a fantastic week thus far. I’m up late yet again writing this post because apparently I don’t need sleep anymore? Ha, if only. Yesterday was particularly stressful, but everything turned out to be a-ok, thank god. If you follow me on instagram, you already know that my dog got surgery. She’s been having health problems for the last year, and it’s been trying to say the least. No one could figure out what was wrong with her, and she was taking medication after medication, which is bad for any dog, but especially her because she’s so little. My furbaby means everything to me so seeing her in pain legit killed me. I found out a few months ago that she had a tumor in her behind, but we weren’t able to remove it because she had other issues that needed to be treated first. Well, I’m thrilled to report that she finally got it removed and is doing well…or as well as she can be in this situation. She’s tired and sore, but I’m optimistic. Our surgeon is having the mass biopsied to make sure it’s benign so I’ll know for sure within the next week or so. Please send Daisy good vibes, everyone. Anywho, let’s move on and talk a bit about today’s OOTD. For my latest, I’m wearing a fab pleated dress from Zara. I purchased it while it was on sale a few months back, and I have zero regrets because it’s so cute and comfy. The material’s lightweight, and the fit’s loose enough to hide food babies of all shapes and sizes. I know that’s kind of a weird statement, but it’s important to me because I LOVE to eat. Now, I like bodycon clothing, but I have to be in the mood for it. This kind of silhouette is way more practical in my opinion, especially if you’re looking for something to wear on the regular. I styled my new pleated dress with animal print sandals and accessorized with a dainty layered necklace courtesy of Full Line Collection. 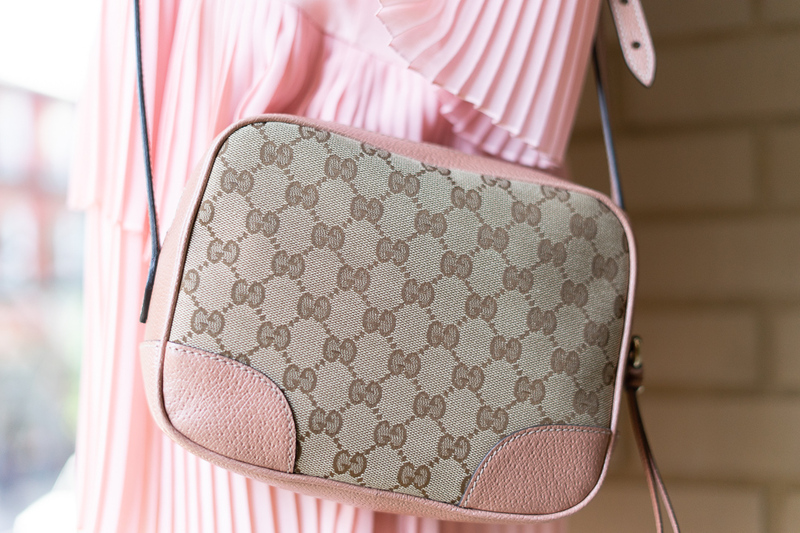 I then carried my Gucci crossbody to match and wore my favorite sunnies from Tory Burch. For those of you wondering, I bought them at Woodbury Commons a while back when I was vacationing in NY with my family – click here for that travel recap! So, what do you guys think of today’s look – is this pleated dress a do or a don’t? How would you style this adorable mini? Photography by the beautiful Eva Liz! For more casual outfit inspiration, click here. Very pretty dress, and a great look (and smile). Hope you get some sleep — someday!